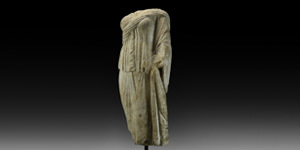 A carved marble goddess or noble lady, standing with palla draped over the left shoulder and arm; the folds and hang of the cloth simply captured; mounted on a custom-made stand. 72 kg, 90cm including stand (35 1/2"). Fine condition. Acquired by the current owner in 2013; previously on the London art market 1992; formerly from a private English collection acquired on the French art market 1980; supplied with geologic report No. TL005210, by geologic consultant Dr R. L. Bonewitz.